The expedition cruise ship, M/V Orion has arrived in Hobart, Australia on Tuesday morning after having made a diversion to rescue Alain Delord, a French solo-yachting sailor who ran into trouble in heavy seas. 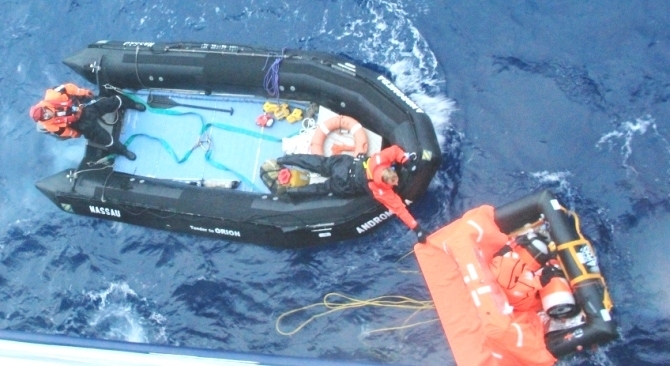 Although the Orion was 687 nautical miles away from Mr Delord, the expedition ship responded to an emergency request from the Australian Maritime Safety Authority and made a two-day diversion off its planned course to save the sailor, who by that time had to abandon his sailing yacht and was in a life raft. Guided by a Royal Australian Air Force helicopter, the crew onboard Orion located the life raft 380 nautical miles south of Hobart and Captain Mike Taylor put a rescue plan into action. This involved positioning the 104-metre ship to the windward end of the raft in an attempt to create a relatively calm patch of water so a zodiac could be deployed. Encourages by the 91-guests onboard the Orion at the time, the rescue team which was lead by Expedition Leader Don Mcintyre, quickly secured the life raft, extracted Mr Delord and transferred him to the safety of the ship in a matter of minutes. In the ships medical centre, Doctor Chris Bulstrode examined Alain, declaring that the sailor was in a remarkably good condition for someone who had been through a traumatic experience. The crew on-board had prepared a suite for the French sailor and provided him with a meal as the Orion set on a course bound for Hobart, the closest port to the ships position at that time. Because of the earlier than scheduled arrival in Hobart as per the ships itinerary, the crew aboard worked closely with the authorities and relevant suppliers in order to arrange guest visits to local attractions, whilst Mr Delord received documentation from France which would allow him entry into Australia and latest reports suggest that the sailor is doing well. As you can imagine, this must have been a harrowing experience and Orion Expedition Cruises, along with the Australian Maritime Safety Authority managed to seamlessly conduct a rescue operation, in which a life was saved.